If you missed out on the previous episode of this trip report, click HERE. 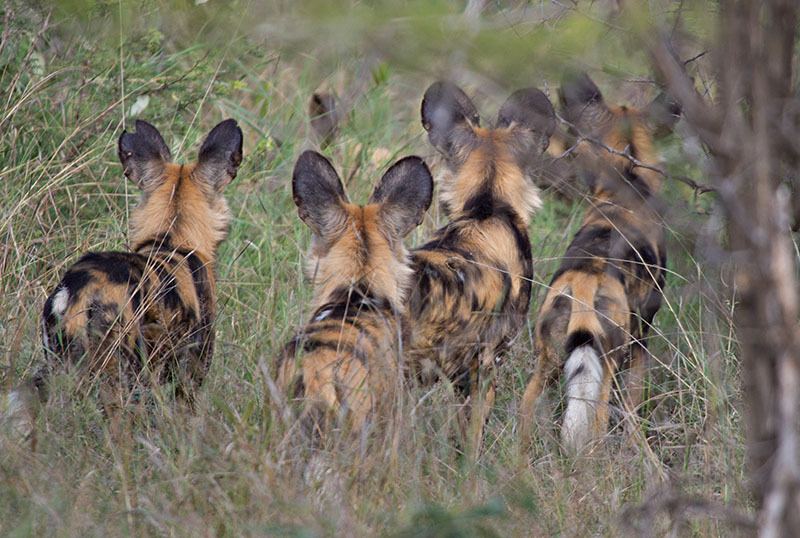 We headed straight for the sighting of African Wild Dogs that was called in on the radio. When we found them they had moved from the side of the road and were staring intently at something deeper in the bushes - would we see them hunt? They soon lost interest in whatever was back there, and proceeded to move about and socialise with each other. 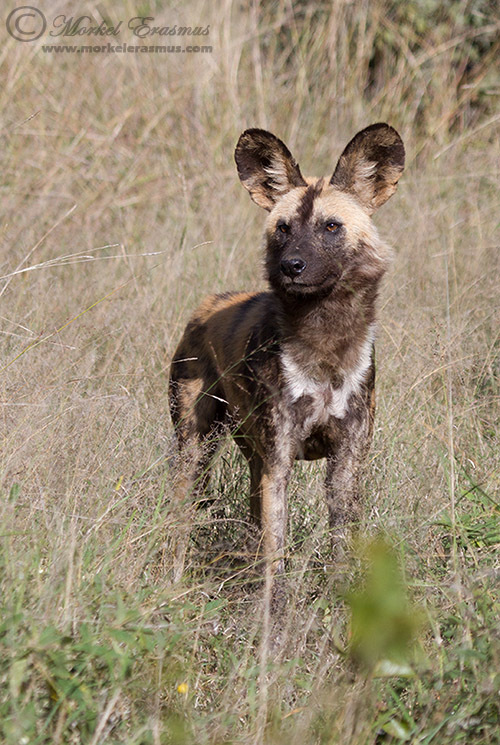 The surrounding bush was quite dense so the images aren't that great - but this was my first proper Painted Dog sighting in years (I don't have much luck with them in the Kruger National Park) and I thoroughly enjoyed spending a good deal of time with them in close proximity, watching the pack interact with each other. 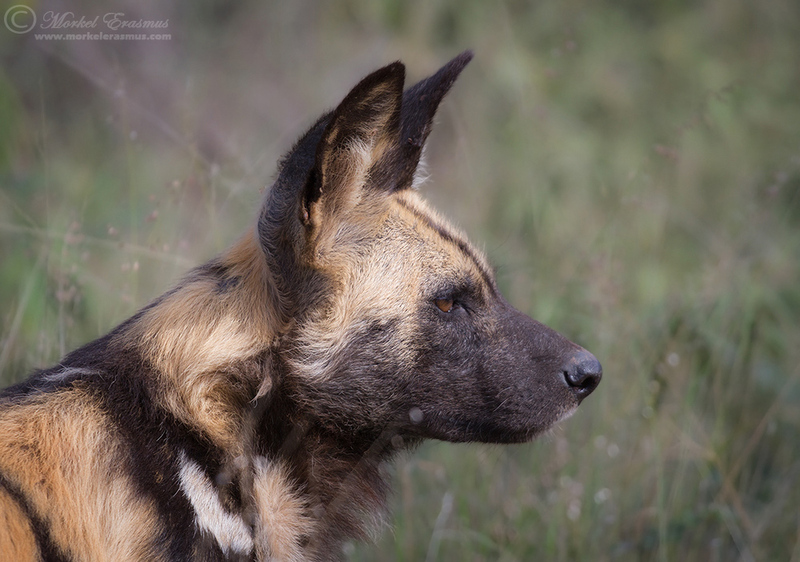 When the dogs decided to lie down, we took our cue to return to the lodge, have a hearty brunch, and relax around the pool watching the wildlife come and go to the small waterhole in front of the lodge. We also met up with Grant Marcus and Gavin Tonkinson, two of the local Madikwe guides involved at the time with Tuningi Safari Lodge. They were keen to join us on our afternoon drive as they didn't have guests to attend to at the time. Later that afternoon we decided to head to a range of kopjes for a sunset shoot - obviously looking for some wildlife sightings on the way. All these great plans were interrupted when this little lady shot across the road right in front of us!! 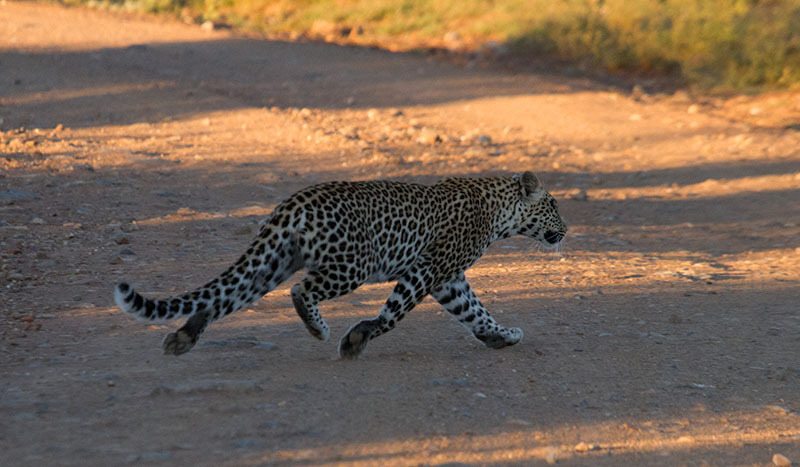 Back then, Madikwe wasn't really known for quality leopard sightings. The cats that were there were known to be skittish around vehicles. 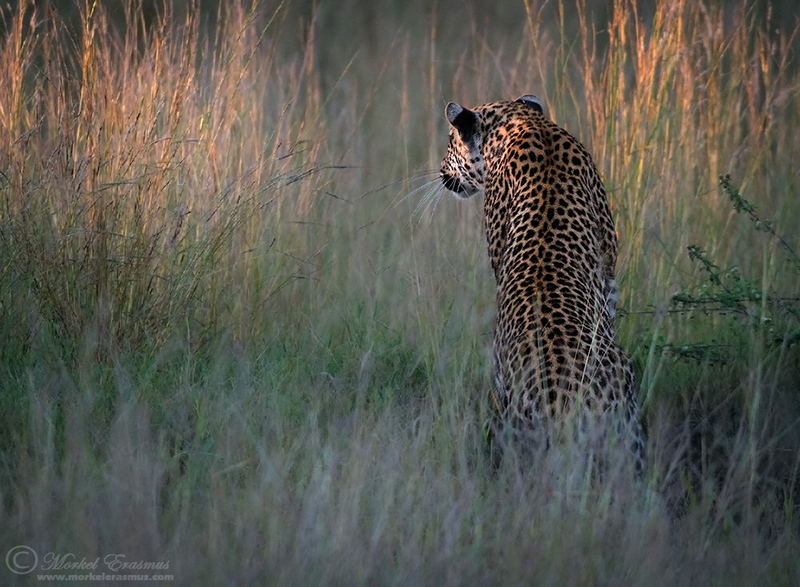 That's all changed now and the reserve produces some great leopard sightings consistently now. 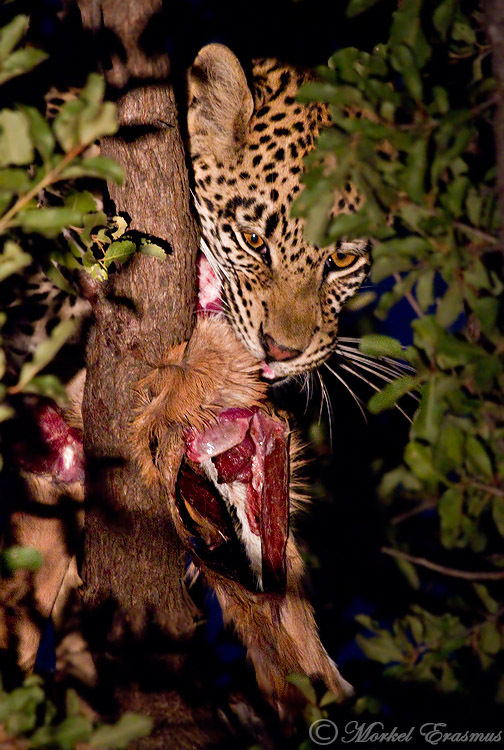 We decided to stick with this young leopardess and see what she does. She ended up providing us with a real quality sighting. Initially, after she scoped us out properly from behind a bush, she sauntered back across the road, and after earning her trust we gently followed her trail off the main road. 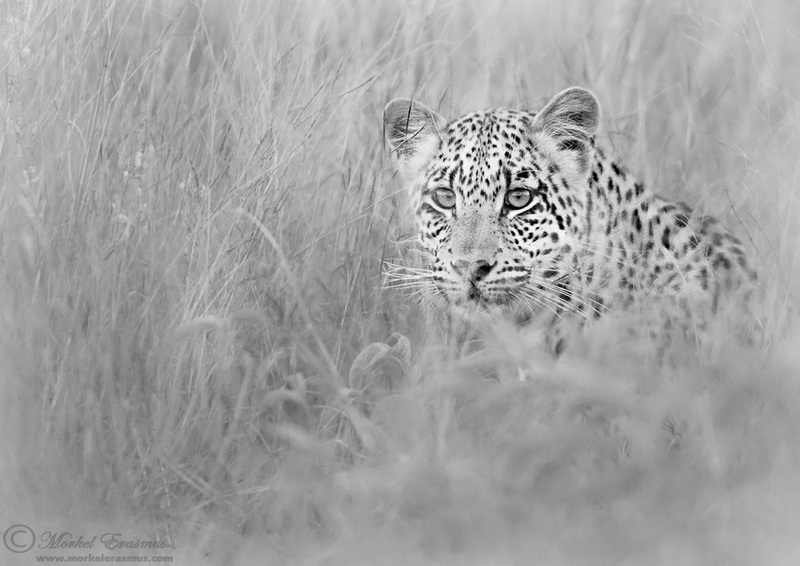 She was skulking through the long grass, peering ahead. Was she on the hunt? There was silence in our vehicle as we held our breath - would we see her jump down on this ignorant antelope right in front of us??? The wind shifted, and just before her quarry was close enough for a pounce, he caught wind of her and bolted in the other direction. She relented and carried on feeding on her existing prey. What a close call! The sun had now set (there goes our sunset shoot on the kopje, but we didn't mind) and we used a spotlight to grab one or two images of her feeding, then left the sighting as other lodge vehicles started to arrive. 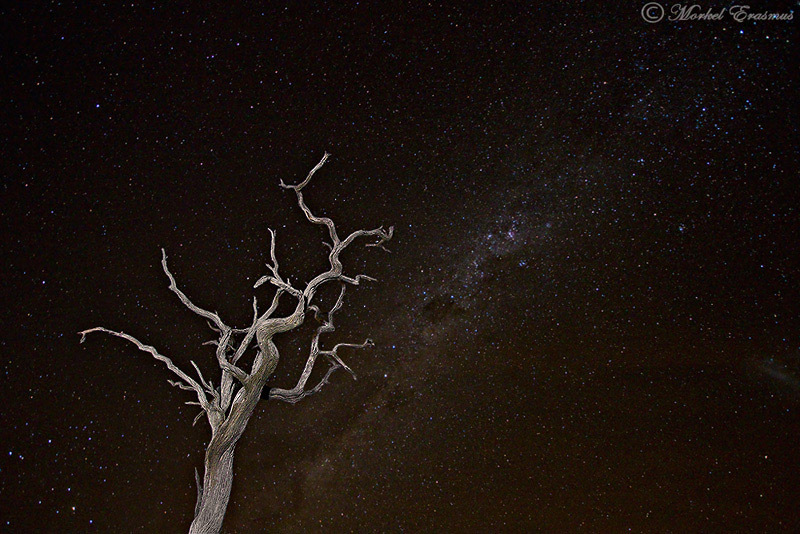 Driving leisurely back to the lodge with the spotlight at the ready, we came across some "African Unicorns" as well (you can figure that one out by yourself), and stopped to photograph some of the iconic dead leadwood trees under the stars as well. I still had a lot to learn about nightscape photography at this stage, but it was fun and that is what matters in the end! We had a jolly dinner around the fire recounting the day's exciting turn of events. What would our last morning in Madikwe hold?